Like I said… I continued reading the Delirium Trilogy, and I’m glad I did. 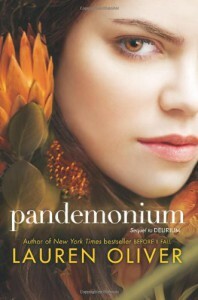 Pandemonium I think it was better than Delirium, it was also a little slow but every chapter had something interesting that kept me reading. 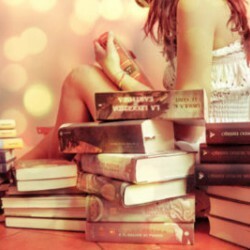 I loved the fact that the book was divided in past and present, and the way they complemented each other. It explained everything so well and smoothly that everything was so clear. Now… lets talk about Julian. At the beginning I didn’t like him… I hated how close minded we has, specially after Lena told him that she haven’t been cured. Then, he made me feel awkward, the way he watched Lena while she was cleaning herself, or while she was sleeping and all that. But then…. I loved, how he starts falling for her, how he starts worrying, taking care of her, comforting her, and all that. And after he was caught, how he refused to get cured; my heart melted at that moment… He only disappointed me when he told Lena that he didn’t knew if she would return for him. Come on! have a little faith man! Now lets skip Raven and Tack’s lie, because we all know we hated them, that it was awful, but after they helped Lena rescue Julian we all forgave the. So, because of that, lets talk about missing people who decided to show up. First Lena’s mom… it what obvious that whey Miss Oliver mentioned that the woman kept calling Lena by her name, and that she had a number, it was obvious who she was. I least for me… but those ironies, so close and so far. But at least she is a step closer to find her. Now what we all want to talk about… the walking (not) dead, Alex. At the beginning I didn’t imagined that, but honestly, I was happy about Lena and Julian’s relationship… so this is bad, so bad for my heart. I don’t know who I want.. I mean… I don’t know what Lena wants… Requiem is going to be a book full of emotions… and what kills me is knowing that someone is gonna end with a broken heart.. or dead..
Now tell me, have you read Pandemonium? What do you think? What did you like and what didn’t you like?